In today’s world, outdoor enthusiasts can easily traverse the trails and climb mountain peaks with modern technology by their side. From premium sleeping bags to 100% waterproof watches, the outdoor gear market has become flooded with smart designs. There is an outdoor gear or tool for almost any reason you can think of and if you are looking to climb to higher altitudes, an altimeter watch is a gadget you’ll want to add to your collection. An altimeter watch is also commonly referred to as an ABC watch because it features an altimeter, barometer, and compass in one device. The information that this watch provides is essential for backcountry adventurers and those who are going to plan a backpacking trip. Altimeter watches can predict when storms near or help climbers keep track of their time. Modern altimeter watch designs may include extra features like a heart rate monitor and GPS capabilities. In this article, you will find information about how to choose the best altimeter watch by looking at all the different styles, features, and designs. With our list, you can stay on top of the latest and best altimeter watch designs. Find the best design that is destined to fit your wrist with our list of the 10 Best Altimeter Watches in 2018! 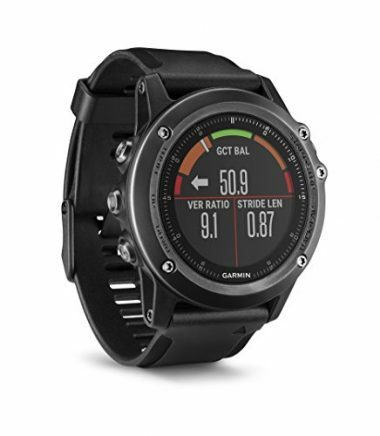 This Fenix 3 HR by Garmin is a top rated ABC watch that was a wrist-based heart rate monitor, chroma display, comfortable silicone band, water resistance, and wireless connectively. Garmin has included in this design, the Elevate wrist heart rate technology that measures the pulse in your wrist to track your heartbeat. The technology is accurate and allows you to avoid wearing a chest strap. There is a 1.2-inch chroma display that is high-resolution and visible, even in sunlight, thanks to the LED backlight. The display is chroma optically-bonded to ensure that you can easily read the screen. There is a color sapphire lens to boost the screens colors, so that they are always visible. On top of the gorgeous display, there is a comfortable band made of black silicone. This band is soft and flexible, which gives a luxurious feel. As well, the band is resistant to discoloration, so you can be sure that this hiking watch always looks fresh out of the box. The watch is water rated up to 10ATM/100 meters. This ensures that Garmin’s design is suitable for swimming and getting it a little wet, won’t hurt the functionality of your watch. 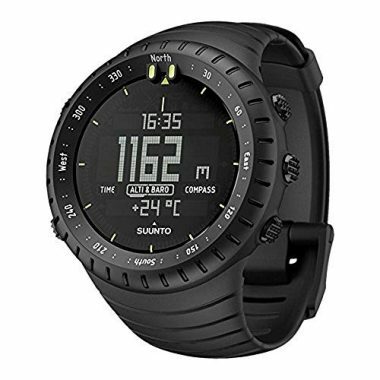 If you would like to incorporate more technology, this altitude watch can be paired to Wi-Fi hotspots so that you can automatically sync your data to Garmin Connect and update the watch’s software. 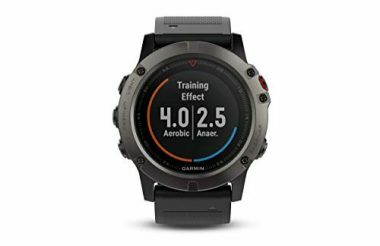 If the Fenix 3 HR by Garmin that was listed as the first product on our list was appealing to you, but you wanted to incorporate a GPS system too, Garmin has you covered. 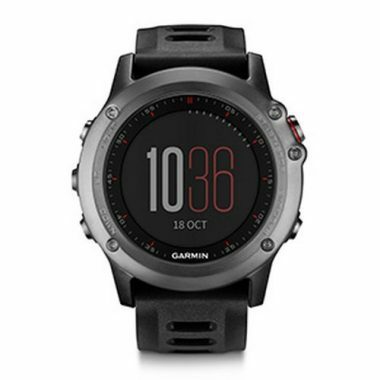 This Fenix 3 GPS Watch by Garmin takes their popular Fenix 3 design and adds an EXO antenna that pairs with GPS/GLONASS satellite reception to provide a faster and more accurate position, than a standalone GPS. As well, there is a 3-axis compass built-in to ensure you are always certain of your position. The watch is made of PVD stainless steel bezel, which gives it heavy protection. There is a silicone band and reinforced housing for extra durability. The silicone band ensures that this mountaineering watch is comfortable to wear at all times. Garmin has included their chroma display, which is LED backlit to ensure that your watch and its information can be read in any light conditions. The watch is rated up to 100 meters and can be used to swim. The battery can last up to 40 hours. 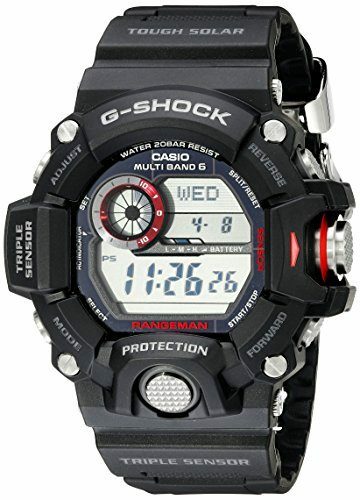 This Master of G Solar Men’s Watch by Casio is a solar-powered digital watch. The watch is made of stainless steel and has multiple displays, red contrasts, and textured pushers. The watch has quartz movement with an analog display. The dial window is protected by the mineral and crystal to ensure that this watch is rugged and durable. 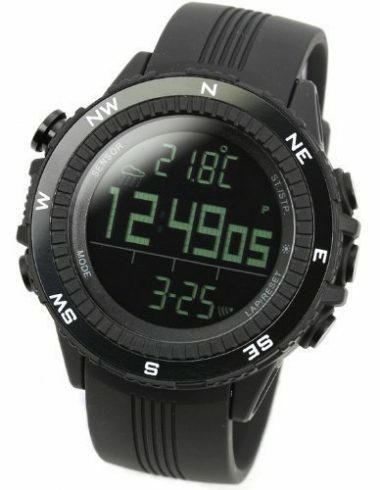 This is a top rated ABC watch that has an altimeter, barometer, and digital compass. 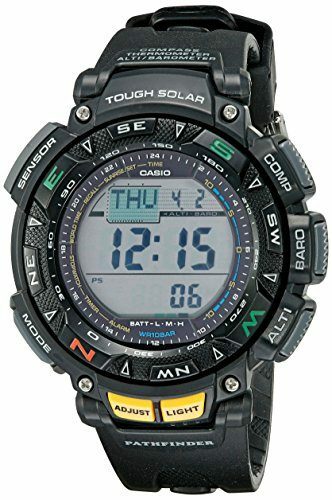 On top of the ABS features, this design by Casio has a thermometer, sunrise and sunset date, time stamp, atomic timekeeping, an auto LED, 5 alarms, stop watch, timer, and calendar. With all the provided information, you are sure to be able to track everything you need while out on the trails. This hiking watch has a buckle closure and is water resistant up to 660 feet. The watch can be used for recreational scuba diving. The watch is G-shock and has a 10 year battery life. With this tough, durable, and rugged watch, you will experience unfailing reliability on all of your outdoor trips. With so many readings at your fingertips, you can feel confident with Casio’s design. With the shock resistant design, you can easily take this elevation watch to new heights. This top rated ABC watch tracks all your movements, the environment, and your location. The Core All Back Military by Suunto can also track the weather and sun for you. There are weather trend graphs and a storm alarm built into the design. With the preset sunrise and sunset times for over 400 locations, you can stay safe and accurately plan your activities. This altitude watch is stylish with an all-black, minimal design that is made of high-quality and durable materials. With this elevation watch, you can ascend and descend with ease. You can also keep track of the storms to ensure you are sheltered before they even hit. With this design, you can stay safe while you explore the outdoors. 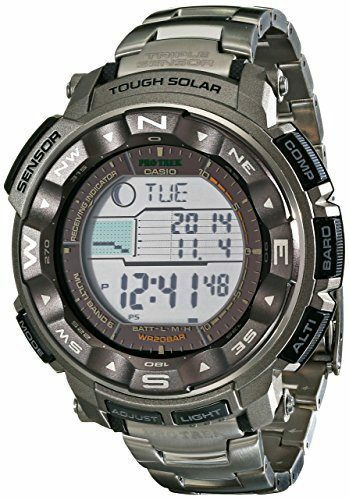 This Men’s Pathfinder Sport Watch by Casio is a solar powered watch that has an altimeter, barometer, and compass. The watch has a low temperature resistance, world times, alarms, stopwatch, calendar, timer, battery power indication, and power-saving function. With one full charge, this watch can last for about 6 months, without needing to be exposed to light again. The watch is made of stainless steel and the dial has a mineral window and digital display. The band is made of resin and features a buckle closure. The watch is water resistant up to 100 m and can be used for swimming and snorkeling. With Casio’s top rated ABC watch, you can explore the world without being held back. With all the added features, you can easily keep track of everything you need and focus on the adventure ahead. 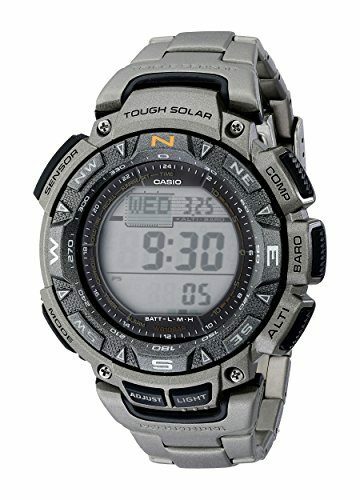 This Men’s Pro Trek Sport Watch by Casio features a solar powered battery with a multi-band design. The watch has atomic timekeeping and is water resistant up to 200 meters. There is a duplex LC display and tide graph, which tracks moon data. This is an ABS watch that has a backlit display and afterglow. There are alarms, world times, and a stopwatch included in the features. The battery can last for 5 months on one charge and there is a power-saving function, which can extend it further. This top rated ABC watch by Casio is perfect for the water based adventurers. With the tide tracking, kayakers and fishers can stay safe when they head out to open waters. This is a solar powered sport watch that has a triple sensor. The three sensors are an altimeter, barometer, and compass. There is also a thermometer included in the features. This watch has a low temperature resistance and backlit display that has an after-glow too. The watch can track world times, daylight savings time, hour time signals, and the date. There is a battery power indicator and power-saving function too. This ABC watch is made of stainless steel and has a mineral dial window. The quartz movement digital display ensures that you can always read the information easily. The watch has a titanium bracelet that features a double locking and fold over clasp. You don’t have to worry about water damage because this watch is resistant up to 100 meters. 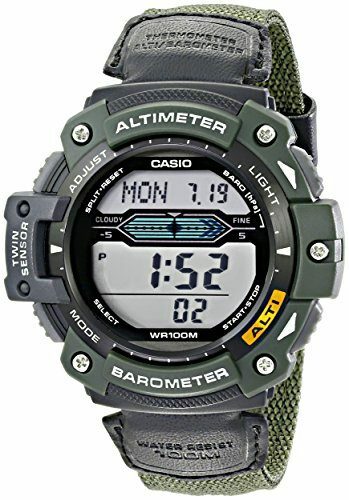 This rugged Men’s Sport Watch with Nylon Band by Casio features multiple digital displays, a bezel with exposed screws, and a woven nylon band that closes with a buckle. This watch has a 50mm resin case and mineral dial window with a quartz movement digital display. This is a top rated ABC watch that has an LED light, thermometer, world time, stopwatch, and alarms included in the features. The watch is water resistant up to 100 meters and can be used for swimming and snorkeling. The watch is the epitome of functionality and you can be sure to rely on its information while on the road. This Altimeter Stopwatch by Lad Weather has a German sensor that provides a weather forecast, altimeter, barometer, and compass. This watch has an altitude graph and can be used to track your travel. There is a thermometer and chronograph to measure the elapsed time. Other features include a timer, dual time mode, and daily alarm. You can keep track of the date too. There is an electro luminescence backlight on the display and the watch has a power-saving mode to boost the length of use. With Lad Weather’s hiking watch, you can go broad and explore the splendid world. If you are looking for the ultimate GPS altimeter watch, this Fenix 5X Sapphire by Garmin is the design for you. This top rated ABC watch features full color TOPOS maps, routable cycling maps, and other outdoor navigation features. This rugged design has a stainless-steel bezel with buttons and a rear case. There is a silicone band for comfort. The GPS that is built-in features GLONASS capability to track in challenging environments and is more accurate than a GPS alone. There is a 3-axis compass and gyroscope too. There are pre-loaded running profiles, which makes this an excellent tool for runners looking to track their stats. With high performance at your fingertips, training just became easier. You can also use Garmin Connect to unlock features like smart notifications, an online fitness community, personalization, and the Connect IQ store. With Garmin’s high-quality design, you can get everything you need in one rugged and durable watch design. When you are deciding which altimeter watch is the best to buy, you will have to decide which features and design will best suit your needs. There are a lot of different watches from surf watches to freediving watches and dive watches, so you may need to know what makes an altimeter watch and why. There are differences in each altimeter watch design that can enhance you experience and make using an altimeter watch easy. If you think paracord survival bracelets are important, an altimeter watch can be an even better gear item to add to your hiking checklist and backpacking checklist. The best altimeter watch will accurately provide you will reliable readings and be long lasting. You should be able to easily add an altimeter watch to your collection of outdoor gear. Altimeter watches will never be 100% accurate, but that is because nature is not always predictable. Altimeter watches can get pretty darn close in their readings, but they use air pressure to measure the changes of altitude. Sometimes an incoming storm may change the air’s pressure, so the reading may not be as accurate. However, if you take the information your altimeter watch presents to you and use it as a good estimate, you can securely rely on your device to give you an accurate guideline. To get the most accurate readings, you should calibrate your altimeter watch often. It may seem trivial because a watch is a smaller sized tool, but an uncomfortable design can distract and frustrate you on the trail. You want to make sure that your watch is comfortable to wear. This could mean ensuring that the design is not too heavy or bulky. It’s best to get a band that has soft and breathable material. You want the watch to have a snug fit, but not be too tight that it restricts circulation. Your altimeter watch should be a device that you look forward to checking, rather than constantly feeling like your watch is distracting you because it is uncomfortable. Altimeter watches need to be durable because they are commonly used in rugged outdoor trips like climbing, hiking, and running. Investing in a watch that has high-quality materials will guarantee that your watch will last throughout multiple years of use. You want to invest in one altimeter watch that will continue to deliver precise and accurate readings throughout the years. You should be able to find a design that is within your budget but doesn’t skimp on the materials and construction. When it comes to durability, your altimeter watch should be top of the class. Readability is important in an altimeter watch’s design because no matter how accurate, if you can’t easily read the information, the watch is of no use to you. You should be sure that you invest in an altimeter watch that presents its readings in a way that makes sense to you. If you are confused by what is shown on the watch face’s display, it’s best to look for a model that is better organized in the display of the information. As well, you should be sure that you can actually read the screen. It shouldn’t be a struggle or cause you frustration when trying to read your altimeter watch, so be sure you have a design that has easy readability. Thanks to modern technology, some altimeter watch designs may come with added features. These tech features can range from a GPS system, thermometers, and a function to track your fitness. If you are looking for an all-in-one design, these features can make your watch high performance in every aspect. If you are looking to lighten your load, you can combine different devices into one great altimeter watch design. For the fitness trackers, these extra features can be a major appeal to investing in an altimeter watch. Rather than having to wear a fitness tracking device and an altimeter watch, they can combine all their tracking needs and altitude measurements into one device. Other adventurers will be very appreciative of an altimeter watch that has GPS functions built-in, so they can track their location on the trail. Other GPS features that may be included would be downloadable maps to use offline. Depending on your personal use, these additional tech features can entice you to invest in an altimeter watch. There are many different styles of altimeter watches. From the color, size, and watch face, you will have many different design options to choose from. Some altimeter watches can feel bulky or their watch face too busy. Others will feel sleek and minimal in their design. It is up to your personal preference to choose an altimeter watch style that catches your style. However, you should not choose an altimeter watch based only on its style. While a style may be appealing to you visually, it may not be the best for you. Rather, you should focus on the performance and what tasks you would like your altimeter watch to complete. Some watches may have features that better suit your needs. As well, a style of watch may not be comfortable for you to wear for long periods of time. It is important that your altimeter watch fits your wrist well. A watch that is too loose can be lost on the trail and on the flip side, a watch that is too tight can cut off blood circulation, causing discomfort. You want your altimeter watch to fit you snugly, so that it won’t fall off your wrist. However, you don’t want the watch too tight that your hand and arm feel uncomfortable. 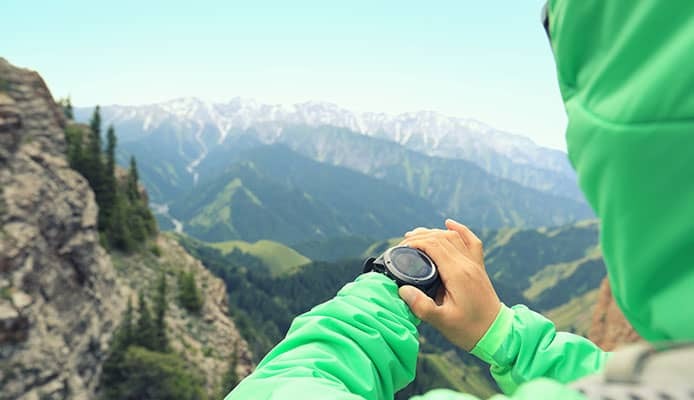 As well, if you are using hardshell jackets, hiking vests, or down jackets, you want to ensure the watch is comfortable with your hiking attire. You should try on as many different altimeter watches as you can to get a feel for the differences between them. If you are online shopping and if needed, be prepared to return a watch and order another one. If you are shopping in store, there should be a representative who can help you with the fit of your watch. An altimeter watch can be used for any outdoor activity, but it is suggested for use with adventurer’s who like to take things to new heights. The main use for an altimeter watch is to track your altitude. If you aren’t going to be going to high altitudes, it may not be worth investing in an altimeter watch. However, others may enjoy the barometric reading, as well as the other high-tech features. 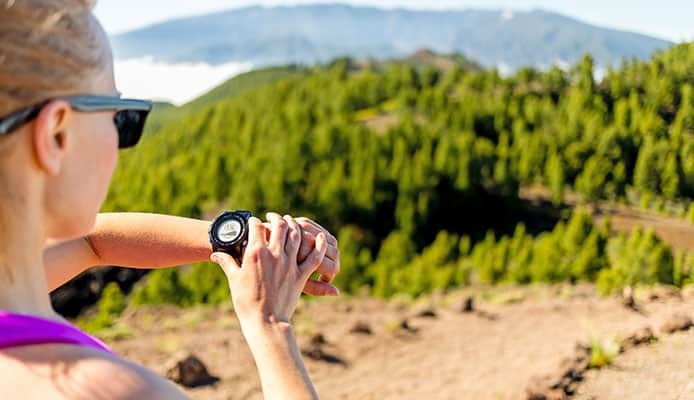 In reality, the best altimeter watch should have no restrictions on which activities it can be used in, but some models may cater to specific activities better than others. For example, a runner may want to track their speed and elevation, but a hiker may just need the altimeter and barometric functions. No matter the activity, the best altimeter watch can easily be taken on any outdoor adventure and used in a variety of scenarios. When you are taking a trip to the great outdoors, every ounce counts. This includes the weight of your altimeter watch. You should get a watch that you are comfortable wearing. The altimeter watch should be a high-tech gadget that you enjoy using and not one that feels like it weighs a thousand pounds on your wrist. It is best to find a watch design that you feel isn’t too heavy for you to wear. After all, it can be a nuisance on the trail if you feel like your arm is dragging. There are many different designs of altimeter watches. Some watches are sleeker and more modern. Other watches have a more rugged feel that are similar to tactical watches. Depending on your style and design preference, you may feel that a bulkier design looks best on your wrist. Or you may choose to have a minimalistic design that brings a modern vibe to the rugged outdoors. The choice is yours to decide which design you want to invest in. With the variety of watch designs today, you should have a large array to choose from. However, it is important to remember that the design of the watch is not the most important aspect. You should not choose an altimeter watch based solely on its design. Instead, like the design factor in your decision but not be the main reason for an investment. Design should come after other important aspects like technology and fit. The display is important in an altimeter watch because it is what you will use to read the provided information. If you find the display confusing to read or you can’t read it at all, it can be quite frustrating to use your altimeter watch when on your trip. You should invest in a design that you can clearly read without a struggle. Your altimeter watch is meant to assist your trip, so be sure that you can read all the information it is giving before you hit the trails. Remember that the display preference will differ between people, likely based on their eyesight. For this reason, there are many different watch display designs to cater to all the different users. Choose a watch that suits your eyesight and is easy for you to read and interpret the information provided on the display. Altimeter watches can be quite bulky because they pack a lot of high-tech instruments into one design. Altimeter watches tend to be wider and thicker than other watch designs. The added size also adds weight. While many designs are fairly large, you should be sure that your watch won’t interfere with your task at hand. You should be sure to find a design that is comfortable for you. Some watch designs are made smaller, which may be a huge benefit to some users. The best you can do is try on multiple watches and get a feel for which dimensions feel the most comfortable on your wrist. How your altimeter watch is powered can be very important to some users. Traditional watches are powered by a coin cell battery that is placed in the back of the watch face. Altimeter watches that are battery powered usually last about a year and have plenty of signals to indicate if the battery is running low. This may be appealing because once you have a battery in place, you don’t have to worry about the watches charge for quite some time. It should also be easy to replace the battery, before it dies completely. Other altimeter watches will use a lithium ion battery because they have battery draining GPS systems. This is less ideal for longer treks, because the battery doesn’t last as long. However, if you aren’t constantly using your GPS system, you can preserve the battery life for longer. Some altimeter watches are even rechargeable, which can be appealing for those who are willing to pack an extra external battery. Depending on how long you use your watch for and how much you rely on its high-tech features, a rechargeable battery can be a draw for certain explorers. Instead of having to have a battery replaced, some users may find charging their altimeter watch is just like remembering to charge your phone. Other altimeter watches have a solar powered battery. Solar watches can be a big intrigue because you don’t have to remember to have a battery replaced nor do you have to remember to charge your device when the battery is low. Solar powered altimeter watches that are high end, should be able to hold a battery charge for months. As well, if you are exposed to sunlight on your adventure, your altimeter watch can charge as you go. This is appealing because you don’t have to constantly remember to plug in and charge your altimeter watch with a cord. Instead, you can simply roll up your sleeve and expose your watch to some Vitamin D.
No matter the charging method you choose for your altimeter watch, you will want to choose a way that feel comfortable for you and serves your needs. A dead battery on an altimeter watch is no use on the trail. Always check your device and ensure that it has a sufficient charge, before you hit the trails and if your device is rechargeable, be sure you have all the items needed to give your altimeter watch an extra boost. Q: How does an altimeter watch measure the elevation of an area? A: Altimeter watches take measurements of the air pressure to determine the altitude. There is less air pressure, the higher up you go. An altimeter watch reads the pressure of the air and internally performs a non-linear calibration to provide you with the changing altitude. An altimeter watch can be made even more accurate by the user providing a reference elevation. If you input the elevation of the city you live in or the mean elevation of the sea level, your altimeter watch can more easily figure out your current elevation. An altimeter watch is pretty darn accurate, but you have to remember that it reads all changes in air pressure. This includes incoming storm fronts, which may raise the air pressure. If you feel your altimeter reading isn’t as accurate as before, try recalibrating your watch or checking the barometer. A slightly different reading could be an indication of an incoming storm, which would provide you with useful information so that you can prepare and find shelter. A: Every altimeter watch design will have a different method used to calibrate the device. It is best to read the manufacturer’s provided information, like their manual or guide to follow the steps for your specific altimeter watch. Some altimeter watches that have GPS systems will calibrate automatically, but every watch should be able to be calibrated manually. In general, to calibrate an altimeter watch you have to provide a starting elevation. This reference elevation can be a benchmark, building, city, or home. The important part is that you know an elevation exactly and can input the information into your watch. If your watch has a GPS system, you should be able to set the elevation to your current location. Then you can set how often you would like your watch to measure. A common measurement is for your watch to read the changes every 20ft you have walked. If you are not actively using your watch, it is extremely important that you re-calibrate your watch often. Regular use of your watch would be weekly or daily. If you are using your watch less often, you should recalibrate it before each use to ensure that the readings stay accurate. It may be a slight annoyance to always have to recalibrate, but it’s the best you can do to ensure that your watch is functioning how you need it to. Q: Do I need GPS in my altimeter watch? A: No. You don’t need GPS in an altimeter, but it may be preferred. An altimeter watch with a GPS system can recalibrate automatically, instead of manually, and provide location tracking information. You should be certain on whether you want an altimeter watch with a GPS system before you buy or vice versa. The prices can be drastically different when it comes to watches that have or don’t have a GPS system. If you wish you’d gotten a GPS system, it can be a pricey error. However, if you are only looking to track altitude, spending the extra money on a GPS system, may not be worth it. You should heavily consider what you want an altimeter watch for and if you will use added technology like a GPS system or you just want the basic ABC readings. Q: Are all altimeter watches considered ABC watches? A: No. Though they are commonly called ABC watches for the altimeter, barometer, and compass, not all altimeter watches include hiking compasses. Some watches only have an altimeter and barometer for measurements. If you are someone who needs a compass, it is still best to invest in an ABC watch. You can carry a separate compass if you like, but the digital compass can give you another accurate reading, which you can rely on. As well, the compass feature does not drain your battery, so really there isn’t much of a difference in having a watch with or without a compass. However, for your safety, it’s important you learn how to use a compass for emergency situations. Q: Why is it important to know the altitude? A: For adventurer’s who like to go to new heights, knowing the altitude is important because it allows you to avoid hypoxia. Hypoxia is a medical condition that is more commonly known as altitude sickness. Hypoxia slows down your cells and turns them against your body. As your cells start to work against you, your body will stop absorbing nutrients and dispelling waste. Altitude sickness can lead to death in extreme cases and you certainly don’t want to face it alone. Outdoor enthusiasts who have altitude sickness often get confused, which means they can be easily lost. Hypoxia also leads to lethargy, headaches, and vomiting. How do people live at altitude? Normally people who live in high-altitude locations, such as the mountains in Colorado, have done so for a very long time. Whether they acclimated in time to the altitude or they were born into it, their bodies are used to the different air. High altitude basically means that the placement of oxygen in the air molecules is different than lower elevations. Oxygen is not as readily available at high altitudes, as it is at lower ones. You can go to higher altitudes, but you may have to give your body time to acclimate. If you ever hear of people going to Mount Everest, the first stop on their journey is often a couple days in the capital of Nepal, Kathmandu, to allow their body to adjust to the new altitude. For outdoor enthusiasts who go to high altitudes, the use of an altimeter watch can help them track their altitude along the way. Some people know the altitude at which their body is comfortable, before hypoxia sets in. If people are trying to get to high altitudes fast, rather than slow, they are more prone to experiencing hypoxia because they aren’t giving their body time to adjust to the changes. Therefore, by tracking your altitude and the time it takes you to climb to certain altitudes, you can reduce the risk of hypoxia by knowing your body’s limits and safely making it back to your camp before having altitude sickness. It is always best to be cautious with altitude. Whether you are using a hiking guide for beginners or are an experienced outdoors adventurer, you can still develop altitude sickness. Investing in an altimeter watch can help you reduce the risk of developing hypoxia. Finding the best altimeter watch can greatly enhance your experience when adventuring in the great outdoors. Altimeter watches can help you keep track of your altitude, location, and fitness and more importantly, help prevent you from getting altitude sickness. With these top rated altimeter watches, you will have peace of mind that your altitude tracking is accurate, allowing you to focus on the beauty of nature and the climb ahead. The best altimeter watches will be easy to use and last throughout the years. Often, altimeter watches are put through rugged terrain and conditions, so finding a durable design is important. You want to be sure you are investing in the best. With our list and guidelines of the 10 Best Altimeter Watches in 2018, you can be sure to find the best model that suits your needs. If you know exactly what you need and want, you can save time and money by investing in a top rated ABC watch. Do you own one of the altimeter watches that made it onto our list? Let us know how it has worked for your outdoor needs in the comments section below.